Found this cool picture of an 1860's era Armstrong muzzle loading gun in the U.S. National Archives photostream on Flickr. The picture was taken in Annapolis, Maryland in 1866 by Matthew Brady of all people, and is described as being in a battery. Where is this gun now, I wonder. It looks to be about a 150 pounder, a big boy, and looks brand new. 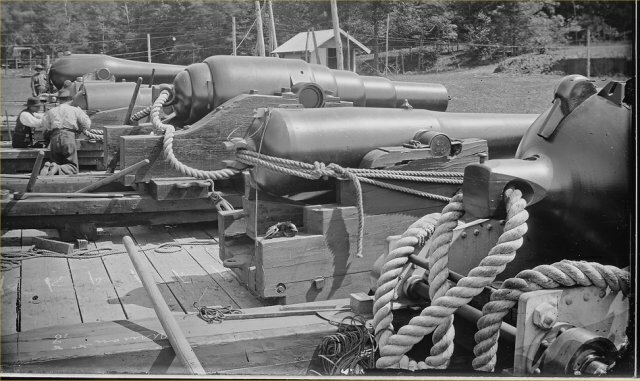 There is a similiar gun at West Point that was one captured from the Confederates at Fort Fisher in 1865, a battle also known as the biggest U. S. amphibious operation before Normandy. The gun fired an exotic elongated shell with copper studs that engaged the rifling for spin, and along with this had Armstrong devised "shunt rifling". This in effect made it easy to load (which is not normally easy on a muzzle loading rifled cannon, and when fired "shunted" the shell to the shallow grooves, which made it very accurate. Also using built up coil construction this made the gun one of the most advanced guns of it's day. The Fort Fisher gun wasn't fired much in anger, due to a small number of British shells for the gun. The Confederates tried to reproduce them but didn't have much luck. The fort had about a dozen shells in all. Fort Fisher is also trying to get it's West Point gun back according to their website. I haven't found out yet what happened to the Annapolis gun, but I'm still looking. Update:7/9/11 According to the Historical Marker Database, this gun was melted down during WW2.